Techniblock SPF 50+ Aerosol Sunscreen for children is a lightweight, non-greasy, non-sticky very water resistant sun protection aerosol spray that is quick and easy to apply and doesn't need rubbing in. 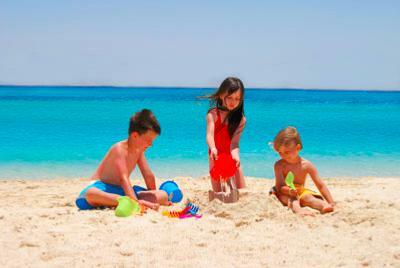 SPF 50+ Sunscreen for Kids has been specifically developed to protect the young and delicate skin of children. Providing an actual Sun Protection Factor (SPF) rating of between 56-61, it is highly suitable for children, ensuring they are well protected from sunburn. What makes Techniblock so unique is how easy it is to use. No need to pin down your young ones and spend ages rubbing in thick, greasy and gooey creams, both you and your child will love the quick and effortless application. And because it isn't greasy, sand won't stick to it! Techniblock is an oil and fragrance-free sunscreen that doesn't contain emulsifiers, which naturally leave behind a sticky residue. Traditional suntan lotions and creams use emulsifiers to host the UV filters and the higher the factor, the thicker and more difficult the sunscreen usually is to rub in. Oils and emulsifiers also break down in water and, therefore, the lotion has to be re-applied frequently, particularly after swimming. Techniblock is different. The active ingredients that prevent sunburn are encapsulated in a clear, CFC-free, ethanol-based spray that evaporates on contact to leave a transparent but effective and very water resistant UV barrier. Even while swimming, Techniblock keeps on working to protect so your children can enjoy the water for longer, allowing parents to be reassured that the powerful, modern formula will keep them safe in the sun. The ultra-dry and instantly absorbed formula offers an invisible UV barrier that's breathable and won’t block pores, making it very suitable for sensitive skin, particularly for those prone to prickly heat. This irritating skin condition is aggravated by high temperatures and rubbing thick and gooey creams in to the skin just makes it worse. According to our customers, Techniblock keeps prickly heat at bay so if your child has sensitive skin or gets heat rashes, this sunscreen should not aggravate so your children can enjoy the sun without worrying about nasty and irritating skin rashes. It also provides instant protection in one quick application, unlike some other sunscreens where you have to wait for up to 45 minutes before going out in the sun in order for the protection to take effect, so it’s easy and convenient to use. The ideal solution for children, who usually hate the fuss and bother of having sunscreen applied and re-applied, especially when they're having fun on the beach or in the pool. Developed in a world-class pharmaceutical laboratory in South Africa, where they certainly know a thing or two about the sun, Techniblock is a tried and trusted brand that has been protecting skin for over 10 years. Packaged in a sealed, airtight container, the formula is not compromised after opening so there’s no need to discard half-used product, making it great value for money, and the twist-top locking cap won’t get clogged with product or leak so there's no risk of spillage in the bottom of your beach bag. Techniblock has a 5* rating and is a broad spectrum protection. This means that it protects against both UVA and UVB protection. UVA is associated with skin damaging and UVB is more associated with sunburn and has strong links to skin cancer. Techniblock is recommended by CANSA (Cancer Association of South Africa) as a preventative measure against skin cancer and is endorsed as a SunSmart choice product. A large can of SPF 50+ will provide your child with all over sun protection for up to 2 weeks. Apply in a sheltered area to ensure even coverage. Can also be applied to the head. Let your children enjoy a sunburn-free summer with Techniblock SPF 50+ Aerosol Sunscreen for Kids.